The world’s most complete social intranet. Free up to 12 people. 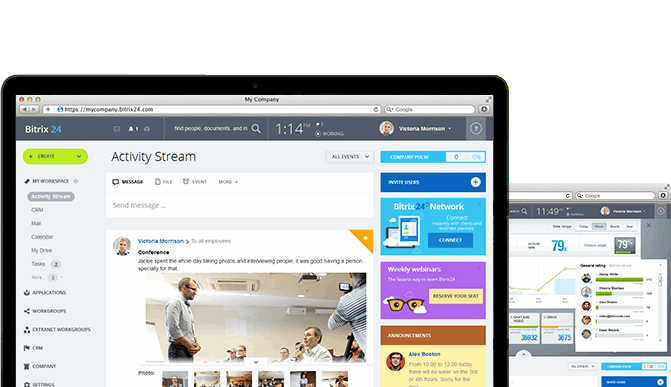 With Bitrix24 you can create an internal social network. The features you are familiar with from Facebook and LinkedIn will now be available for your teams. They will not only be communicating via email but will also make use of a timeline and chat application to share information together more efficiently. 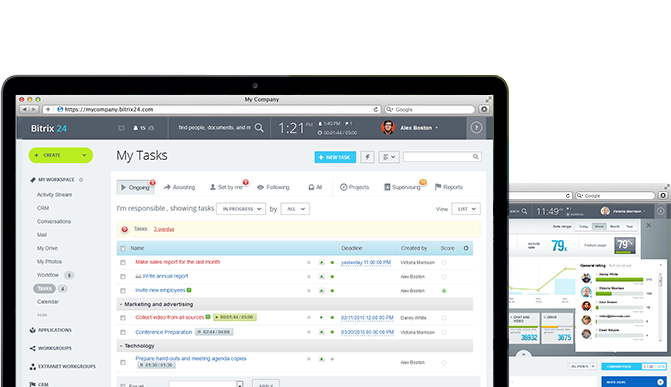 Project teams can create their own working spaces with all information centrally available. They can use the project planner (Gantt Charts) or create tasks for themselves and others. Managers can have access to reports on all levels. 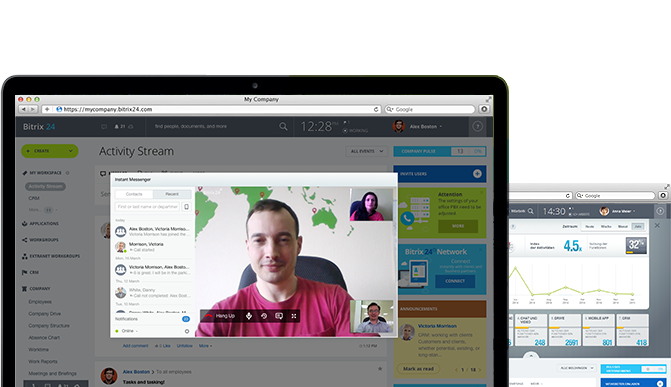 Company Chat, Chatbots & Video calls. Organisations can no longer do without: a chat as a way to communicate more effectively with co-workers. Where email can be slow, disruptive and ineffective, chat is a way to communicate quicker, in fewer words and more flexibly. 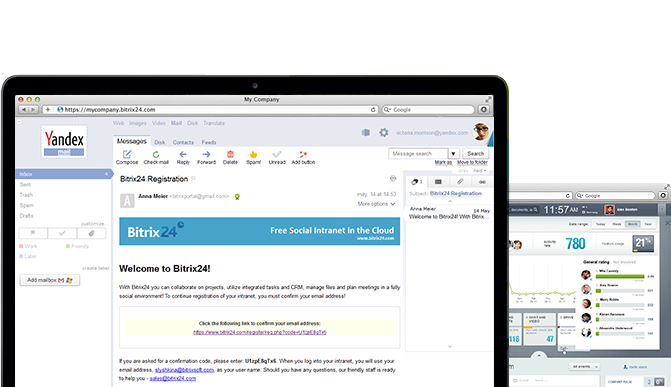 With Bitrix24 you create channels, groups and even chatbots that enable interaction with your data. Bitrix24 scans our local servers for documents and will make these searchable. 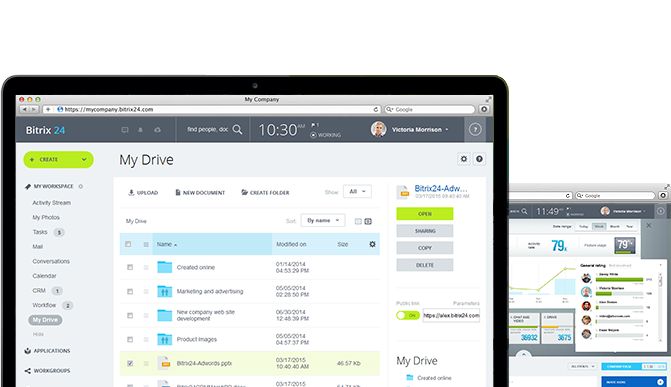 Bitrix24 can be connected to Google Drive, Dropbox or Office 365. File storage, Editing & Management. With Bitrix24 Drive you have the opportunity to store your files on a secure cloud environment. This can be within your own infrastructure or even via external cloud hosting. You can create personal and group folders, enabled for online editing. And the good thing is: you don’t even need to be in the same office or behind a desktop computer. Also via apps on iOS and Android you can have access and join in. 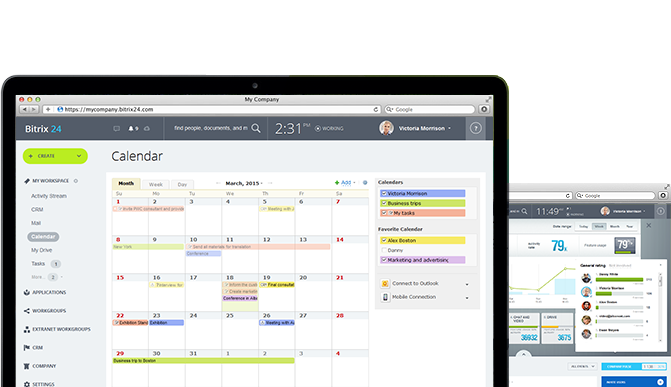 Not only calendar and schedule management are standard functionalities, but also appointing resources, such as meeting spaces, hire cars or beamers. An all-in-one system. Stand alone or in cooperation with Microsoft Outlook or Google Calendar. Less email traffic is a result of cooperating more socially. But, working completely without email is something we won’t and can’t do. This is why Bitrix24 has included email in the total package. As a separate tool or as a possible integration with Google Mail or Microsoft Exchange. 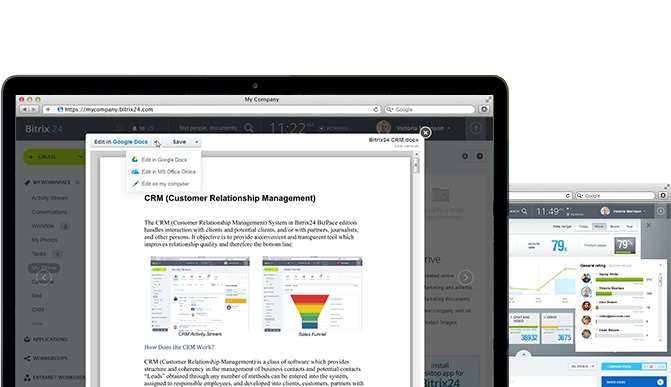 Another advantage is that in certain cases, it is possible to connect CRM and email. That opens up a lot of opportunities. In Bitrix24 you will find an extensive CRM package, suitable for relationship management and salesforce support. All events (calls, messages and meetings), that can be linked to a contact, will be saved. But, also think about functionalities such as creating reports, sales funnels and dashboards. And even an invoicing module is part of this package. Of course, everything is designed to also run smoothly on mobile devices. As most of the time spent behind a screen, you are on the road, right? VOIP Telephone services & Switchboard (PBX). 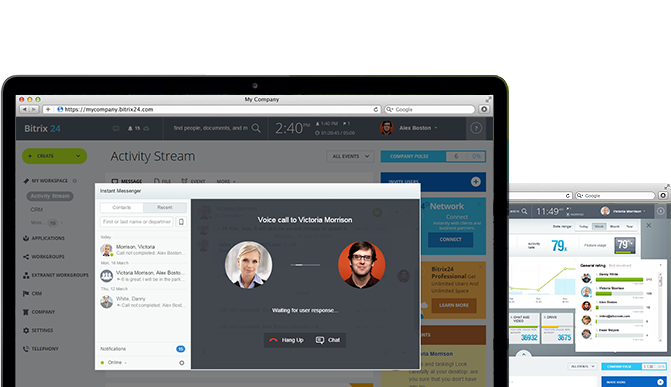 Calling or video calling works directly from the desktop app, mobile apps or web apps. You can make outbound calls to mobile or land lines all over the world, at extremely low costs. Calls can be monitored and recorded in your CRM. Cheaper than Skype and most other service providers. Make calls by using a headset connected to your desktop or connect a SIP-phone if you fancy another device on your desk. Other options: set up opening hours, different voicemails, queue management and many more. Bitrix24 offers several tools to support a Human Resources Department. 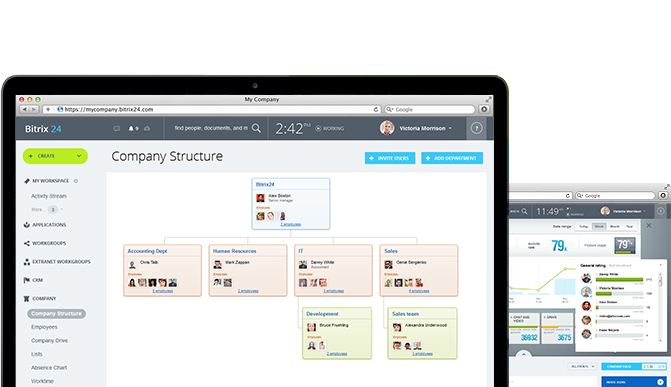 It lets you easily create an organisation chart, which shows an overview of all departments and it makes sure that frequently used functions (e.g. requesting leave days, expenses claims) can go via a steady workflow. Employees can register their hours and are encouraged to share what they are currently working on. Possibly the most important aspect: Bitrix24 helps build a strong team spirit in the workplace. 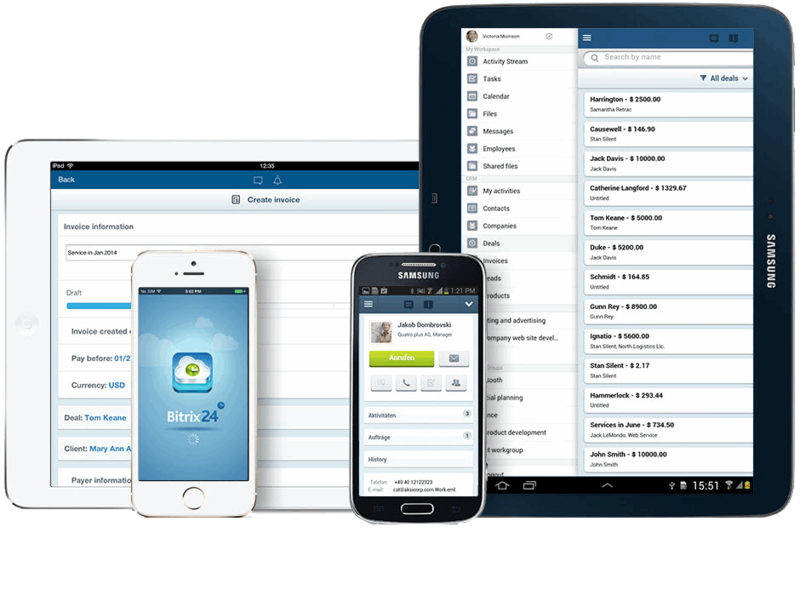 By default, Bitrix24 includes free apps for tablets and smartphones hosted by Apple iOS or Android. There are also desktop apps which include chat and phone applications. These apps are available for Apple OSX and Microsoft Windows. Information is available and synchronised on all your devices. There is a whole. Lot. More. This sounds like an etcetera, but when we say a whole lot more, we mean it. In Bitrix24 you will, for example, find a complete Business Process tool, dashboards for using the network, a considerable number of safety measures, connections with ERP, Warehouse and website packages. But even e-learning, support and a helpdesk functionality are part of the package.